Man first set foot on the moon decades ago, so isn't it high time to build a house up there? Swedish artist Mikael Genberg thinks so. He is trying to raise $15 million via global crowdfunding to send a self-assembling house to the moon next year. 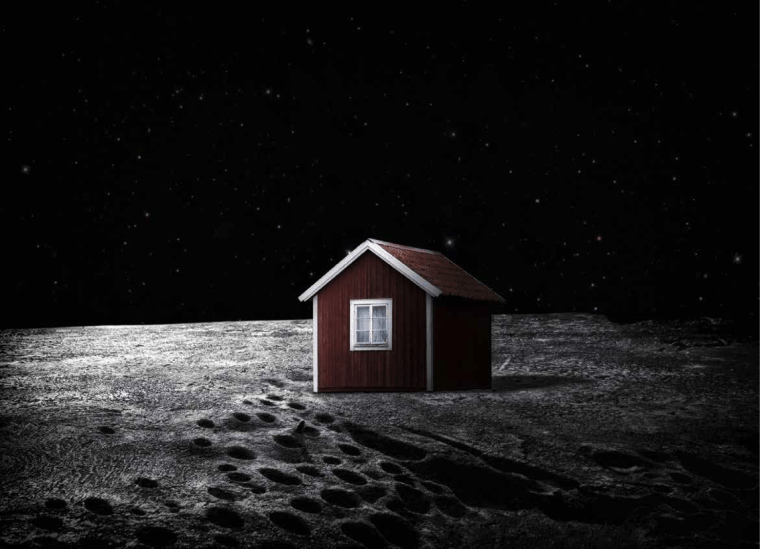 The ‘Moonhouse” will be red with white gables — resembling “a typical Swedish red cottage,” Genberg says — measuring 2 by 3 meters (6 ½ by 10 feet) at the base. It will be more of an “art project” than actual human living quarters. The plan calls for the house to be dropped onto the moon's surface via SpaceX’s Falcon 9 rocket in October 2015. According to the design, the house is outlined by a thin, specially developed space-cloth, which will be stretched over a carbon structure. It is engineered to automatically unfold and self-construct once it’s placed on the lunar surface and filled up with gas, so there’s no need for an astronaut to be on hand. “A small red house can be the symbol of prosperity, of thinking bigger thoughts, breaking new mental barriers and actually making this planet a lot better,” Genberg says in a promotional video on the Moonhouse project website, where the fundraising is taking place. Collaborators on the project include Falu Rodfarg, the 250-year-old Swedish paint company that makes the signature Falu red paint customarily found on traditional Swedish countryside houses, and U.S. space robotics company Astrobotic Technology. Genberg is no stranger to out-of-the-ordinary art projects. In 2000, he created the Utter Inn ("Otter Inn" in English), an underwater hotel room in a lake near Stockholm. Genberg first conceived the idea of putting an art project on the moon about 15 years ago, but the recent global financial crisis meant he had to defer his dream. Now that economies have recovered somewhat, Genberg says there’s no reason why his lofty plan can’t be realized.